Complete rescan of my 7¼-years-old original upload. Synopsis: Treasure hunters kidnap Ann. 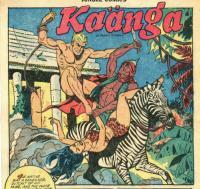 Kaänga pursues and kills the treasure hunters and frees Ann. Synopsis: As a joke, Wambi disguises himself as a spirit and frightens Tawn and Ogg. They are angered and say they no longer trust him. Word spreads that Wambi no longer has friends and the cheetahs take advantage of the situation by engaging wanton killing. Wambi then uses his disguise to frighten the cheetahs and is forgiven by Tawn and Ogg. Synopsis: Terry and the lancers go upriver to reduce the fortress of the raider Pemba-san. 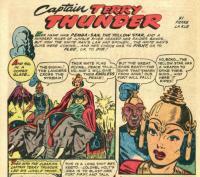 Terry disguises himself as Pemba-san's war chief and infiltrates her fortress, freeing her prisoners and opening the gates for the lancers. Synopsis: Trader Dawson is framed for the murder of the Zembembawe price, Orano, by his partner. 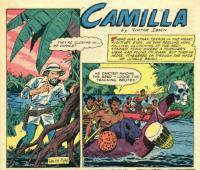 Camilla frees the captured Dawson and shows the tribe that the crime was committed by the partner.